During this weekend we held our own Cub Camp at Horley where the Cubs camped in twos in their own small tents and we used Taurus Lodge for catering, dining and indoor activities. We called the camp a ‘Bits and Bobs’ camp, as there was no specific theme and, as we only had eight Cubs, we were able to pack a lot into the weekend. We concentrated mainly on the requirements of the Naturalist Activity Badge which included a very enjoyable and eye opening nature walk around the campsite, an amazing session on trees, their leafs and berries plus an in depth study of the trees. The Cubs also had to do some refresher work on the Countryside Code, incorporating working with compass bearings, as well as produce a piece of art on an A2 sheet of paper using natural materials. We were very impressed with what imaginative pieces the Cubs produced. All eight Cubs were awarded the badge at the end of the weekend. We also included lots of fun and games into the weekend which also covered some of the activities that the new Cub Programme requires us to do. 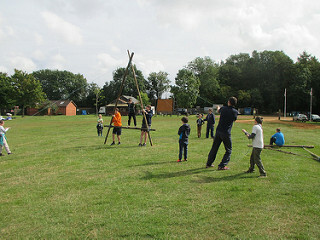 These included a wide game based on the Beetle Drive game, making ‘A’ frames using pioneering poles and lashings then ‘walking’ them across the field using ropes, with the Cubs taking it in turns to stand on the frame, a frustrating but fun challenge using cardboard tubes and golf balls and a game we now affectionately call ‘Hands on Plastic’ where objects are made out of play doh with the team trying to guess what the object is. The Leader’s team was very competitive and noisy with this game! We were able to teach the Cubs some new camp fire songs on the Saturday evening, which they all sang with enthusiasm, then, on the Sunday morning, introduce the Cubs to a traditional Scouts Own service held in the peace and tranquillity of the Chapel in the woods. A very big thank you to the six Leaders and Young Leader for all their help and contributions to this successful camp.